Official Viwawa Blog: Sushido's October Specials! Everyone's craving for the Taiki (level 5), Sakeme (level 13) and Masugurai (level 28) off our sushi stalls! 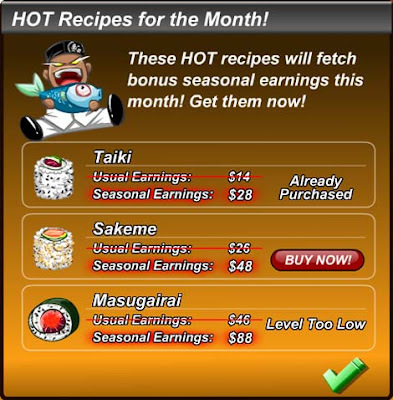 With the insane demand, customers are paying twice as much for these sushis during this peak season and the sushi masters in Sushido are making a killing out of it! This screen will display once you're logged in, so start serving them and take advantage of the special prices NOW before the craze ends! Click here to see more about Sushido.